America’s quality universities are among the key sources of its greatness. Every year, top students from all over the world vie for access to graduate and undergraduate programs in the US, and American universities occupy most of the top spots in global rankings. Moreover, the basic research conducted at US universities has been a primary driver of innovation and economic growth, as well as the source of a disproportionate share of Nobel prizes. America’s universities cater to a wide variety of students, researchers, and other economic actors. The top research universities attract not just the best and the brightest students, but also clusters of high-tech companies, such as those in Silicon Valley and Boston. At the same time, public and private universities across the country offer excellent programs for four-year degrees. And community colleges provide vocational training as well as a pathway to a four-year degree for countless other high-school graduates. With competition between public and private institutions ensuring a high level of excellence across the board, higher education in the US has long been a major export industry. According to Catherine Rampell of the Washington Post, US “educational exports are about as big as (US) total exports of soybeans, coal and natural gas combined.” With three times more foreign students studying in the US than Americans studying abroad, the US higher education sector contributed a net surplus of around $34 billion to the US current account in 2017. Foreign students’ attendance at US universities confers many advantages. For starters, these students usually pay full tuition rates (especially at the undergraduate level), which allows universities to allocate more financial aid for Americans who need it. At the graduate level, more than half of those enrolled in computer science and engineering programs are foreign-born and could remain in the US to work. Without them, America’s high-tech companies would face an even greater talent shortage than they already do. Finally, the presence of foreign students enriches the university experience for Americans themselves. And, as an added soft power bonus, many foreign students return home as staunch supporters of America, and can influence their country’s foreign policy positions accordingly. Until 2016, the number of foreign students studying in the US had been rising, but it then fell by around 3 percent in 2016, and by 6.6 percent in 2017. And initial reports indicate that it dropped by another 7 percent in 2018. Part of this decline is probably due to the fact that other countries have recognized the importance of hosting top-quality universities, and are working harder to attract foreign students and retain their own. But another important factor is US President Donald Trump’s administration. Since Trump’s inauguration, it has become harder to obtain a student visa, and foreign students already enrolled in US universities have had to worry about whether they will be able to travel to and from their home country. The unwelcoming atmosphere -- epitomized by Trump’s notorious travel ban -- is deterring a growing number of first-rate students from pursuing higher education in the US. To be sure, there are also problems within the US higher education sector itself. Complaints about rising tuition and fees, for example, have been building for years. What is often forgotten, though, is that the knowledge one gains from leading universities has also become more valuable, particularly in fields such as biochemistry, computer science and environmental studies. And even in other fields, innovations such as big data have vastly enhanced our understanding and broadened the scope of practical applications in areas such as business, medicine, and public policy. Put another way, one rarely hears complaints about the price of a Tesla compared to that of a Ford, or about the price of a Ford today compared to that of a Model T in the 1920s. Insofar as tuition costs have risen, a large part of it is almost certainly due to advances in knowledge, and thus the quality of a four-year degree. Just as a car today is more valuable than one from 100 years ago, so, too, is a four-year degree. Of course, even as knowledge has increased, so have other costs. According to a study of 13 US colleges and universities by the Boston Consulting Group, “regulatory compliance represents 3 to 11 percent of higher education institutions’ nonhospital operating expenses.” And with the emergence of new cutting-edge fields and highly paid opportunities in the private sector, the costs of attracting and retaining faculty have also risen. As a partial solution, colleges and universities have increased their financial aid to offset the “sticker price” (full tuition charges) for more students. In fact, some universities now spend as much as half of their budgets on financial aid. But, again, the more foreign students there are to pay full tuition, the smaller this burden will be. For all of his complaints about the US trade deficit, Trump is shooting himself in the foot by ordering his administration to tighten visa requirements and thereby undercutting exports of US higher education services, as well as harming higher education itself. With other countries attempting to beef up their own universities, the US should be increasing its efforts to attract foreign students. Doing so would cost the US nothing, attract the talent its economy needs, and make higher education more affordable for more Americans. 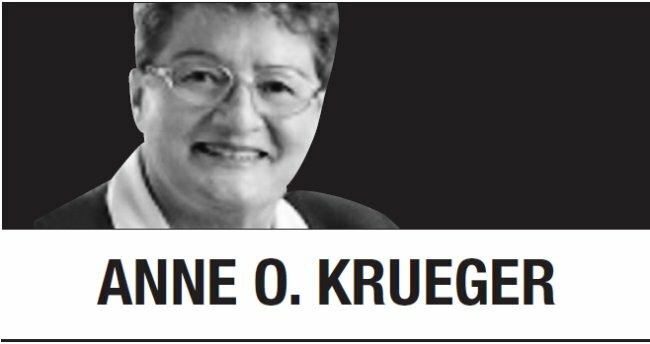 Anne O. Krueger, a former World Bank chief economist and former first deputy managing director of the International Monetary Fund, is senior research professor of international economics at the School of Advanced International Studies, Johns Hopkins University, and senior fellow at the Center for International Development, Stanford University. -- Ed.